May 30, 1939 –The Chicago and North Western Railroad rolls out a set of brand new diesel-electric locomotives, just off the assembly line of the Elctro-Motive Corporation in LaGrange, to pull the “400,” its famous high-speed train, to Milwaukee. In the coming week the locomotives will be placed in service between Chicago and St. Paul, Minnesota. The new locomotives are capable of running 117 miles an hour even though they are still pulling standard equipment. Sometime in August new streamlined cars from the Chicago shops of the Pullman Standard Car Manufacturing Company will be added to the consist. The new locomotives are powered by four 1,000 horsepower 12-cylinder diesel engines, which drive four generators that supply current to eight traction motors, four on each unit. 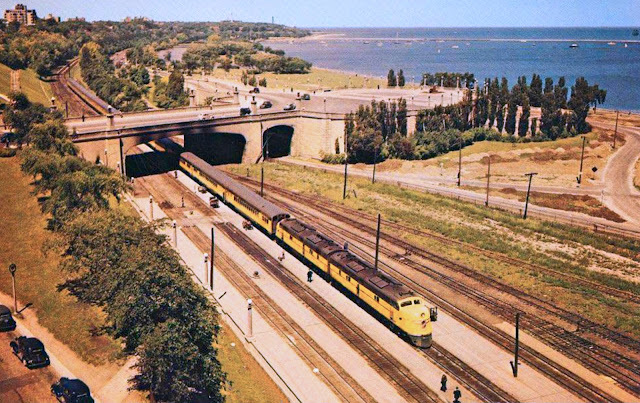 Finally, after nearly a half-century of trying to clear the smoke of steam locomotives from the lakefront and the southwest side of the city, it appears that a solution has arrived. 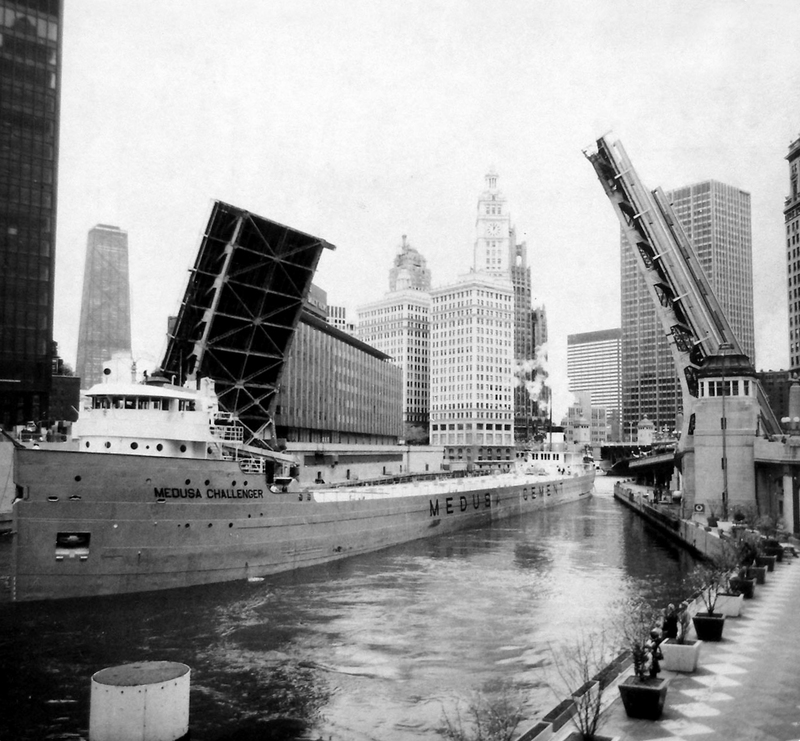 May 30, 1968 – It has only been a year that the Medusa Challenger has been at work on the Chicago River, but the big lake freighter will continue to make her presence known for years, indirectly causing enough traffic problems during her time sailing through the city to cause Chicagoans to refer to her as the “jinx ship.” On this night the 562-foot ship is halted in her trip up the river when the Clark Street bridge short-circuits and refuses to open. With the Dearborn and State Street bridges open to allow the ship to approach Clark Street, the malfunction causes traffic on all three streets to stop for an hour and 15 minutes. Finally, at 7:30 p.m. the Clark Street bridge is made operable and “with a blast of its horn, the ship was under way as was the traffic, including one car driven by a man who had a permanent solution to the whole problem … ‘You know what they should do with this river?’ he said. ‘They should have it paved.’” [Chicago Tribune, May 31, 1968] For all you might ever want to know about the ship and its ill-fortune in Chicago, you can head to this section of Connecting the Windy City. 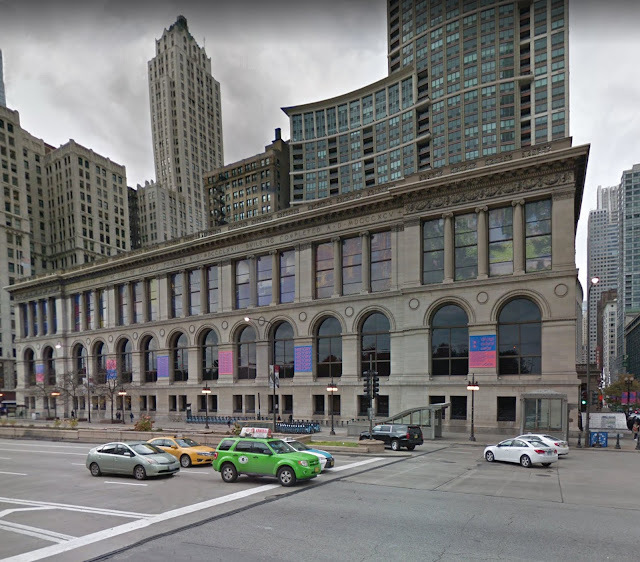 May 30, 1893 – The laying of the cornerstone of the new Memorial Hall on the southwest corner of Michigan Avenue and Randolph Street takes place under the direction of the Grand Army of the Republic. Both streets are crowded with veterans and ordinary citizens “all anxious to behold the ceremony and listen to the addresses incident upon the formal commencement of the creation of a magnificent structure, which will be a credit to the city and take high rank among the costly edifices already so numerous in Chicago.” [Chicago Daily Tribune, May 31, 1893] The plot of ground, known as Dearborn Park, was originally part of the southern boundary of Fort Dearborn, part of the “public ground” that extended east to the lake and south to Madison Street. It required a coming together of the Directors of the Chicago Public Library and the Grand Army of the Republic to get a bill through Congress that would allow construction on the land. It took persistence . . . the legislation only passed after three attempts over the course of ten years. In a simple ceremony the flag is run to the top of the flag pole, a band plays the Star Spangled Banner and dozens of artifacts are placed in a copper box that will lie below the cornerstone. Then General E. A. Blodgett, the Commander of the Illinois Grand Army of the Republic, closes the ceremony, saying, “In the name of the soldiers and sailors who have saved our nation we thank you for the honor. We rejoice that our city thus proclaims to the world that patriotic self-sacrifice is not to be forgotten. We trust that our beloved land may never again be deluged in blood. Yet we remember that the perils of peace are scarcely less than the perils of war. The demands for loyalty are as great upon the sons as they were upon the sires. The price of liberty is eternal vigilance.” The Memorial Hall with its great dome occupies the northern half of what is today the Chicago Cultural Center. 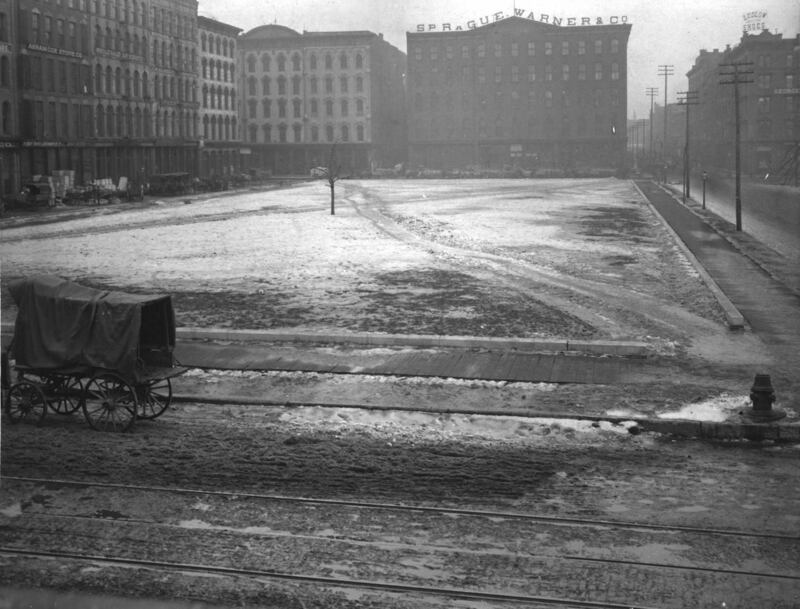 The photo above shows the site at the time with Randolph Street on the right and Washington Boulevard on the left. The second photo shows the area as it appears today.